We’ve learned a lot creating ZippySig. We’re formally stating our goals for version two of our beloved (and sometimes loathed) email signature generator to keep ourselves on track and grounded in what matters to our customers. If we achieve all of the goals we set out here, they may not all be evident to our customers at first glance, but they are all stated with the overarching goal: provide the best email signature generator for our customers… And we want do achieve this by a large margin! 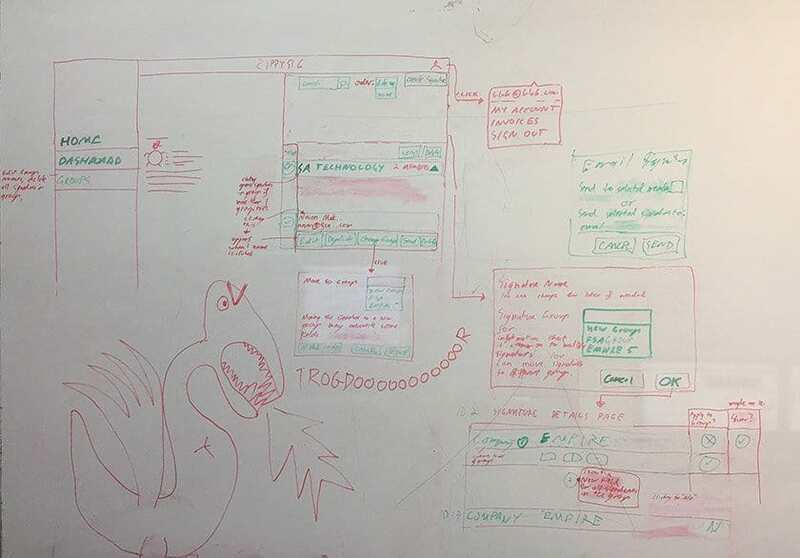 This one is more about our workflow than the application but I thought I had better mention it here since it’s fairly important none-the-less. It’s deceptively difficult to create a user interface that remains functional and intuitive. I would often design a menu and placement in Photoshop ready for coding into ZippySig. I would then start coding it up and showing it to the others in the office, only for the feature to be quickly shot down as confusing. Someone would suggest another way to implement the new feature, only for everyone else to shoot that implementation down as quickly as mine! ZippySig V2 is being created from the ground up with this in mind. Menu’s are well placed, users are visually guided to the next logical steps, and there’s no chopping and changing slowing things down. We get a reasonable number of support requests asking whether it’s possible to create a signature with a very particular set of fields and style. For the most part, we can create these designs, although sometimes they don’t quite fit into the existing ZippySig fields and we are left with two options. The first option is to tell the customer that we can get pretty close, but not quite what they want. The second is to tell the customer to put their phone number into the address field (or some other equally regretful answer). Zippysig V2 will not have this problem, because customers will be able add, remove, and re-order fields as they like! ZippySig has base templates which are intended as a base scaffold for your email signature. You can then add changes and customise styles as you like. This allows a high level of customisation but it still means you need to put in the time to customize the signature. ZippySig version 2 will solve this problem by providing many more layouts. Customers will even be able to share their layout designs with other customers! This method should allow customers to choose a design more quickly and lessen the amount of customisation required. Since ZippySig is currently made with an emphasis on customisation over pre-made styles, we’ve discovered that it can take customers by surprise just how difficult it is to make a signature when it’s up to them to choose the font, colors, font size, and everything else. Our new implementation will solve this problem! ZippySig currently allows you to duplicate signatures and edit them as needed, which means you can design a signature, test and get it approved for company wide use, but if you start creating signatures and then decide that you need to make some changes, you’ll have to make the changes in multiple signatures. ZippySig V2 will solve this problem! 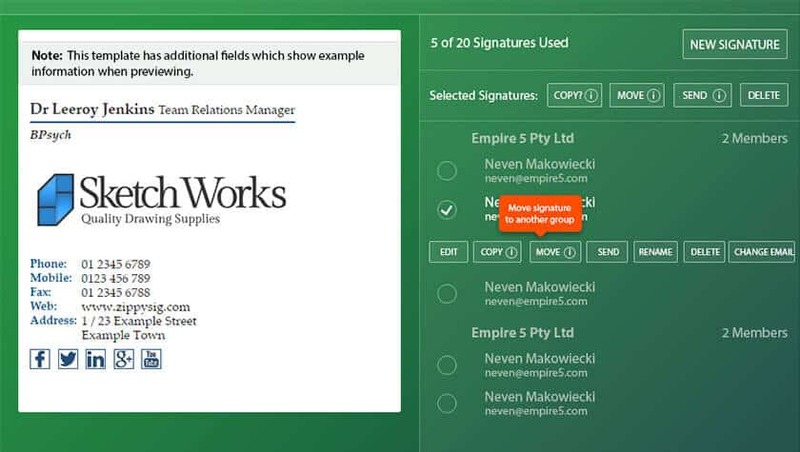 You will be able to apply changes to multiple signatures in an instant, and even put signatures into different groups. ZippySig V2 will be set up perfectly for companies which design signatures for multiple companies. If a company logo changes, or half the staff need a new address, you’ll be able to make the change in seconds! These goals might not be immediately evident, but they will make many aspects of our email signature generator more efficient. Which definitely has a noticeable effect. The’re pretty nerdy though so I won’t mind if you don’t care as much about these! Lightening the traffic load between your browser and the server has many benefits such as decreasing our server costs, widening our audience to include those with slower internet connections, increasing the reliability of our database by decreasing data redundancy. Implementing a standard style early in the development process allows us to keep a consistent visual message and speeds up development. We shouldn’t be asking ourselves “what colour and size should this particular button be?”. This is a big one… There’s a term in web development, DRY (Don’t Repeat Yourself). ZippySig currently does a pretty good job here, except for in one aspect of the templating system which means when a bug is found, we’ve got to update all of our templates, which can take a long time! Our new data structure will eliminate this problem completely which means our signatures will be reliable, and when new email software comes out and we need to make a change, it can be implemented quickly! Previous Post« Previous ZippySig v2 is coming soon!